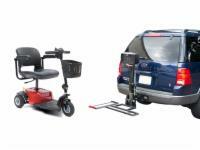 The AmeriGlide Traveler Companion Vehicle Lift/Scooter Lift Package takes the guesswork out of trying to find the right vehicle lift to fit both your car and your scooter. Save time and money by ordering our package deal today! One component of this incredible package is the AmeriGlide Traveler Companion Vehicle Lift, which has been especially designed with versatility in mind. It can accommodate almost any vehicle and was made to fit class I, II, and II trailer hitches, making it the utimate in vehicle lifts. This powerful model also features a streamlined design that is compact and takes up as little room as possible. When not in use, the lift can be folded up and out of the way. The open platform design means that your view out the rear window will not be obstructed by a clunky lift. The AmeriGlide Traveler Travel Scooter is lightweight and easy to maneuver without compromising power. It features a compact, 3-wheel design, which makes it easy to steer through crowds, down narrow aisles, or any other tight spaces. In addition, this sporty scooter comes with long-lasting batteries that will keep you on the move. Together, these two products make the perfect combination that will provide maximum mobility and versatility. Get this package deal to enjoy even more savings!